Pwen Ibo (Ibo point). Made from terra cotta, bone, wood, and cloth. Pwen possess the power of a lwa or the spirit of an ancestor. Made by maji practitioners, they offer protection to those who request them. © MCC/ CMC, Frank Wimart. Mauro Peressini is walking, most respectfully, through the rooms of the Canadian Museum of Civilization that, come November 15, will be filled with sacred Haitian voodoo objects. On this particular day, with many of the 300 artifacts still to be installed in the 15-month-long exhibition, the rooms are largely bare, except for a few man-sized scary figures called lwas. These are the voodoo spirits that can, according to adherents of the religion, enter people and take control. These lwas have been deconsecrated by voodoo priests or priestesses. But they are far from simply inanimate objects. They are, for example, deliberately not being put into glass display cases. That would be disrespectful. Peressini, the lead curator for Vodou, says museum staff have been trained in how to deal with anyone who suddenly falls under the spell of a lwa in the exhibition. Such people are to be held closely and carefully guided to a seated position on a chair until the trance passes. This is no joke. There are voodoo ceremonies regularly practised by some members of the 100,000 Haitian expats in the Montreal area and elsewhere in Canada. Peressini consulted widely with “voodooists” in both Montreal and in Haiti in preparation for this exhibition. It is very possible that some adherents of the religion could come to see the exhibition in Gatineau and encounter representations of lwas that have a particular connection to them. The reaction may be more than an urge to snap a photo. Anyone who has ever witnessed a true voodoo ceremony knows that almost anything can happen to those who believe. Bodies can suddenly become immune to pain, emit strange sounds, or be bent into shapes that do not seem humanly possible. True believers can feel possessed by a lwa and forced to do things against their will. Rèn Kongo (Queen of the Congo), made of concrete. This representation of Rèn Kongo is rich in symbols. 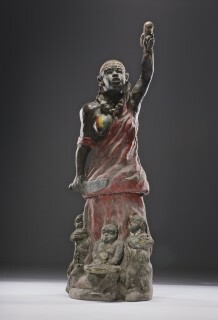 The lwa bears the word “Guinée” (Guinea) on her right breast, a reference to a mythical ancestral Africa. Her left breast has been cut off, like that of an Amazon. Rèn Kongo is portrayed as a female warrior holding a machete, evoking the female cavalry and infantry units of the Kingdom of Dahomey (present-day Benin). The children at her feet represent the human race, over which she reigns. © MCC/ CMC, Marie-Louise Deruaz. Voodoo is being treated as a respected religion in Civilization’s exhibition in the manner the museum might treat an exhibition about Islam, Buddhism, Christianity, or indigenous North American spirituality. The exhibition will contain doll-like figures, sculptures, rattles, a sacred altar, baroque mirrors that act as conduits to the spirit world, and oddly-shaped “pakes” that are containers of magic ingredients. Various exhibits will demonstrate how voodoo fits into Haitian history, the hierarchy and power of the lwas and the religion’s power to heal. 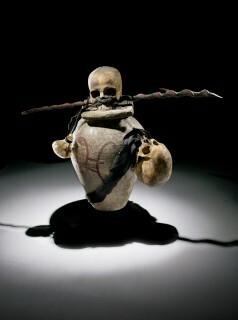 Throughout the exhibition will be videos of real voodoo disciples discussing aspects of the religion. This collection of artifacts has been touring Europe since 2008 with stops in Germany, Switzerland, Sweden, and The Netherlands. Now it comes to Gatineau. Afterward, it is expected to tour Canada and the United States. Voodoo is a religion rooted in Africa, brought to Haiti centuries ago by slaves and then influenced by the Caribbean country’s now extinct indigenous people, the Taino, and by Roman Catholicism. Many Haitians consider themselves simultaneously followers of both voodoo and Catholicism. The overwhelming majority of the voodoo artifacts in the exhibition were collected by Marianne Lehmann, a Swiss woman who moved to Haiti in 1957 and still lives in Petionville, an upscale area of Port-au-Prince. Vodou opens November 15 and will be on view at the Canadian Museum of Civilization until 2014.